It's week seven of the NFL season and Mark Chapman, Osi Umenyiora and Jason Bell run through extended highlights from the weekend's action. Browse content similar to Week 7. Check below for episodes and series from the same categories and more! He's going to fire towards the end zone. Reno have lost have lost the ball the ball up the near side. I know we're intrigued to see what he'll reveal this time round. Can't believe I've done this whole link like this. We join the game in the second quarter with Tampa Bay 6-3 up. From up-Tait state New York come the Buffalo Bills. COMMENTATOR: In the air, it's got the distance. The Buccs - one Super Bowl, one victory. like Jameis Winston's shoulder, a bit sore. COMMENTATOR: LeSean McCoy on the back field. formation and he just gets absolutely dropped here. He's running free, down the sideline. Here's where Cameron Brate is often instead the other way. Again, it's lining OJ Howard up, away from the play. Lavonte David who comes out of there with a fumble from McCoy. Only the third giveaway by this Buffalo team. We talked about how they don't beat themselves. Winston on the move for the end zone. He had to catch it and keep his feet in, and I don't know how he did it. It's ruled a touchdown, the official standing right there. Tyrod Taylor having to come back and open. There's a flag after the hit, and a second flag. Put 15 more on that, hit to a defenseless player. Well, he has two today, and we have a tie game. That is not easy to do down in the red zone. Ball came out at the end, and Buffalo has it. Tre'Davious White knocks it out and recovers it. We saw Lavonte David get LeSean McCoy. and that was key, along with getting near the first down marker. Stephen Houschka, the veteran kicker, from 30 yards away. He's made from 52 25, and drills it. A little drama, but he got it through. I felt like there's a lot of heart on this football team. Really, to me, personifies this city, doesn't it? and came out with the win, so it's good to see. collar, everybody pulling together, digging in? You can see them, in the way they're playing. Away, they've had that kind of stigma to them. to identify what your team is, and he's doing that. differential, you can explain this, is very, very impressive. So it's about takeaways and giveaways. fumbles than you do interceptions and fumbles on offense. So they're winning the turnover margin taking away the ball. And 10 is a big number at this stage? Let's look at some of their players then. The quarterback is going to try to throw the ball into the zone. Which is the space between the linebackers and the DB. and that's why he tried to fit it in there. You see him trying to pass it off, right. Pass it off and disguise it right here. Awareness, his eyes on the quarterback. That is part of what he's trying to do. That's what he's doing and I really like this guy as a player. Once again we talked about running to the ball. We call this the peanut punch, the Charles Tillman. This is more important than the actual tackle, the punch. Having the awareness to come and punch that ball out right there. That's how they're winning the turnover margin. and say how great he was at these kind of things. So this is why we're showing Ryan Davies' play here, yes? You guys are just speaking facts, it's not like you're lying. I got the record for the most of these in the NFL. part is, you see him go for the swipe. which is the biggest play in sports. I think we might get one more angle of that. And this team is creating these kind of plays, you know. We're going to show you now this man here, right. Deonte Thompson, now he only joined from Chicago on Tuesday night. we've had to put a Buffalo shirt over his Chicago shirt. We haven't actually managed to put one on him up there at all. But he arrived on Tuesday, he can't learn a play book in four days? So you've just got to teach him a couple of plays. And you see what he did in this game, he went vertical. of plays and he went out there and delivered. You see him making catches in traffic. You can also catch the show on the iPlayer. Let's take a look at our first round-up of Week 7.
for Arizona's Carson Palmer in the 2nd quarter. It led to a an interception by Lamarcus Joyner. Now estimated to be out for eight weeks. and they are now an impressive five and two. It could be musical chairs in Cleveland v Tennesse game. Hue Jackson then benched him for the second week running. Tennesse's Ryan Succop was the hero from 47 yards to win it. Tennesse now four and three and on top of the AFC South. Cleveland better not bring that stuff over here. We're going to be great entertainers over here. Brett Hundley had his first career start. Green Bay relied on Aaron Jones' running. in the 4th quarter and the Saints are now four and two. Roethlisberger threw two touchdowns, including this one. He also touched the ball, Osi, 38 times in this game. That is an incredible amount of touches, man. 38 touches is entirely too much for him. He's going to break down if they keep on running him like this. Yeah, you see why he missed half the pre-season, right? But that's a difficult balance then, isn't it? because they are going to need this guy late on in the season. They can't afford to keep running him like this. to Week 14, 15 maybe in a the playoffs? He's always had an up-and-down kind of way of his season rolling. He'll have a game like this and the next game not as many yards. JuJu Smith-Schuster scoring the touchdown. Of course celebrations are allowed by the NFL. They have relaxed the rules this year. I'm not sure he is aware of what game is going on! But they then go and play hide and seek. it adds a little bit of entertainment, doesn't it? It's like children at play, basically. more than maybe you would expect them to. But without Aaron Rodgers, that kind of makes sense. Run the ball, make easy throws when you can. He threw 12 from 25 for only 87 yards. Green Bay fans are going to have to be patient here, aren't they? I mean, nobody is Aaron Rodgers bar Aaron Rodgers. defenders into the area where you are trying to run the ball. we're excited at the prospect of taking a stroll around Minnesota! with a roof to shield everyone from the Arctic conditions. the Vikings firstly need to make the playoffs. That is Brandon Carr with the interception. It is the worst nightmare for a quarterback. The Vikings went into the break with a 9-6 lead. put on the pressure and cause confusion. Latavius Murray, his first touchdown of the season. He's just going to run, it's wide-open here. Looks like Jefferson and Weddle right here. Jefferson wide-open in the middle of the field. COMMENTARY: Flacco under pressure again! There is really nowhere for Joe Flacco to go. Kendrick is coming in, finishing off. the following possession to stretch their lead to 12 points. Joe Flacco for the screen, that is not going to work. Anthony Barr recognises it and he beats him to it. Flacco to Chris Moore is the final play of this game. The Minnesota Vikings winning it by 24-16.
they're feeling ahead of this trip to London. that is what he was talking about there. There is a guy on our show by the name of Jason Bell. He can't shut up about Harrison Smith! And me and Mark don't think you know him. Do you know a guy by the name of Jason Bell, or not? are in some of the best form you have ever had? plays here and there that I wish I did something different on. me or beside me have more success at his job. So we all play well together right now. You have been out here before this off-season. is an advantage that only a couple of guys get to have. There is time for those other things maybe in the off-season. getting to enjoy the UK makes it a little bit easier for myself. Harrison, you have got a secondary who has been playing outstanding. But I want to ask you about the defensive line. These guys are really creating havoc up front. situations they're getting off the ball. game so he is really hard to play against, hard to defend. organisation, then we can control what happens to us. How much do you love flying aeroplanes? I don't get up there until it is the off-season. just enjoy it and go on some fun trips and things. But it is fun, it is like a stress reliever. So his thing is art, mine is flying planes. That's my friend, he knows things about me! Harrison, thank you so much for coming on. have to admit they currently reign supreme. comebacks of all comebacks last week in Atlanta. the worst offence in the league somehow came out 2017 winners. Whose experienced arm will show the way now? COMMENTARY: Josh McCown looking up top for Jermaine. I love the fact that Josh McCown throws them open. timing with the receivers and the quarterback and gets lost. I'm not sure that ball hits the ground. After reviewing the play, the ruling on the field is changed. Cutler rolling to his right and there is Landry. And that is exactly where Cutler goes! 36th touchdown of Fasano's career - 3rd and 14. The rookie Chad Hansen split to the left of McCown. So the Jets are going to be forced to punt with 3.16 to go. Ball tipped in the air and that is intercepted! And wouldn't you know, it is Muhammad Wilkerson. He must have heard us talking about him! the interception sets up a 2nd and goal for the Jets. Up the middle, waiting for the signal on the touchdown. Cannot pull it in but there is a flag on the field. And you can see Cutler is slow to get up. Jordan Jenkins was the man with the pressure. That is the shot you take and you are exposed in that pocket. You cannot protect these quarterbacks any more. He hits them in the right target and that is a good, clean play. and you are vulnerable in that position. That has made the rookie safety, definitely a miscommunication. 3rd and nine, to the backfield for Josh McCown. Keep your eye on Jermaine to the outside of your screen. McCown running to his right, directing traffic. Austin Seferian-Jenkins what a year he has had. Delayed handoff, and that is not going to do it. Dolphins two of eight on third down so far today. someone they wanted to get more involved today. He goes the other direction this time. Matt Moore, his first touchdown pass of the season. Austin Seferian-Jenkins, Anderson and Kerley out on the field. Complete to Landry inside the five yard line. has done since the entering the game for Jake. goal from. It's up and it is good. That's going to be the ball game. don't think this team is built to lay-down. We will come out winning. is a reason why he hasn't been in the football gales. You have Cutler. ball more. It opens up things for them down the field. You are right. quarter. The Jags have now done to four and three. You got it, buddy. intercepted twice. Jackson had two over 75 yard returns for touchdowns. touchdowns. This is his third. 2 yards this one in the 3rd quarter. time. They played key ball with lacy before putting in Richardson. offense over there. Our final game comes from Monday night football. a touchdown. The rookie out of Wisconsin. be escaping from the 18 yard line. How on in the world did that happen? go? Wentz. He gets caught. And another touchdown. Deep drop. yet. He fire fires one for Reed. Touchdown Washington. know, they did some things early that got to us. shot. A lot of guys would probably duck and run or throw the ball away. his name. All the Eagles players surrounded him as well. When he goes down, Osi can tell you, he's one of the best in the league. mark, how was the defense going to play. They are playing lights out. for them. Jacksonville rebranded themselves. It's week seven of the NFL season and Mark Chapman, two-time Super Bowl winner Osi Umenyiora and former NFL corner Jason Bell run through extended highlights from the weekend's action. 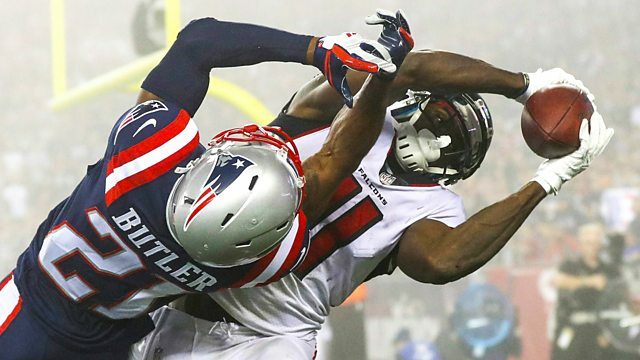 The New England Patriots host the Atlanta Falcons for the first time since the epic Super Bowl LI where Atlanta surrendered at 28-3 lead to Tom Brady and the Patriots.